When I recently returned to my hometown of Woodstock (about 90 miles north of NYC) after a long time away, I was surprised at what I found. Twenty years ago, I couldn’t get out of the small town fast enough. Now? I’m wondering why I shouldn’t live here full-time. No longer the hippie haven of tie-dye and incense renowned around the world for the Woodstock Music Festival of 1969, Woodstock has been evolving with the influx of weekenders and city transplants breathing new life into the area. Upmarket restaurants and curated boutiques that are more hipster than hippie sit alongside the old stalwarts, creating an interesting juxtaposition of eras. Despite this, what’s unique about Woodstock is that while it continues to be one of the top weekend retreat areas for city dwellers, it remains unpretentious and puts the focus on slowing down and escaping the rat race. One business that seems to be nailing this? Woodstock Way, a boutique hotel that embraces laidback luxury and encourages guests to “drop by, tune in, turn off”. 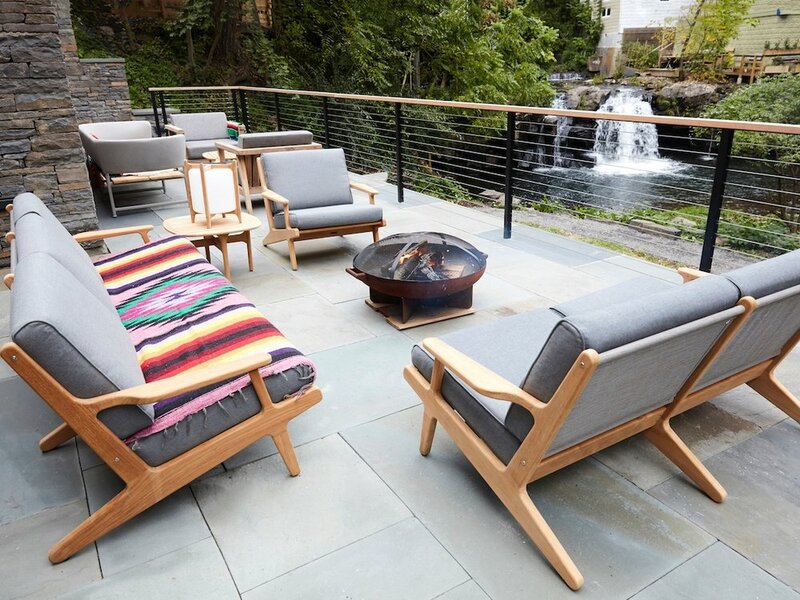 This eco-conscious boutique hotel, owned by Ryan Giuliani and Jesse Halliburton, opened in late 2018 right in the center of town. The intention was to create something that didn’t yet exist in the area - a property that honored Woodstock’s long legacy as an arts and music town while meeting the modern tourist’s needs. Woodstock Way Hotel knows its guests just want to enjoy art, nature, and have a good time. The people who stay here are open-minded, looking for an experience outside the norm, open to meeting all walks of life, and aren’t afraid to step outside their comfort zone. The hotel was designed and built consciously without sacrificing aesthetics. There are living roof systems and bio retention ponds, along with reclaimed materials and locally sourced products used within the construction and operations. The hotel is tucked down a small unpaved road named Waterfall Way, right next to the Center for Photography on Tinker Street, Woodstock’s main strip. After coming upon a charming antiques shop called The Treasure Chest Antiques, you’ll see a newer wooden building pop up around the corner. The overall design and decor of the hotel are best described as rustic chic and were handled by interior designer Jenny Keenan. Wood, textiles, and organic shapes provide character and warmth throughout the spaces, complemented by cool metals, tiles, and angular lines to keep the design from feeling too “country”. Take the coffee bar for instance. The moody slate-colored herringbone subway tiles play off the wood and earthy ceramics and subtly define the area within The Tannery. There are also some nibbles available to purchase if you get peckish, as well as a selection of items (including Lord Jones products, jams and maple syrup, and jewelry) if you want to pick up some gifts. The staff are young, friendly, and unpretentious - a refreshing change from the more polished but often less approachable staff at luxury boutique hotels in New York City. Before heading out to dinner, I wandered back to The Tannery to ask about something and ended up chatting with two of the gals at the coffee bar about the best foods in the area. Overall, the service here is very hands-off and that’s far from a bad thing (unless you prefer white glove service and all the bells and whistles). For me, it’s far more relaxing to know that although someone will always be around should I need something, I’ll be left to my own devices with as much or as little interaction as I want. Every room is decorated differently at Woodstock Way so every time you stay (assuming you haven’t chosen a favorite room), you’ll discover new artwork, music, and design details. I stayed in the King Waterfall Suite on the upper floor of a two-unit building which, true to name, boasts a king size bed and a fabulous view of the town’s little waterfall. Wooden floors and finishings, a soaring ceiling, and top-to-bottom windows make the suite feel absolutely palatial. If you were to judge on square feet alone, you’re already getting huge value for money compared to other hotels. Everything about the room felt thoughtful and deliberate, and more like a home than a hotel. The robes weren’t typical white hotel robes, but soft handwoven ones in earthy colors by OddBird co. And of course there was the curated stack of vinyls (mine was by Scott Ian from Anthrax), just begging to be played on the bluetooth-enabled record player. This is one of those cases where digital is not necessarily better - there’s something about vinyls that makes the listening experience richer and more authentic than your iTunes playlist. Gorgeous and light-filled during the day, the King Waterfall Suite doesn’t disappoint! The sitting area is perfectly set up for some downtime. Stretch out on the couch, pour yourself some water (there are two refillable glass bottles with still and sparkling) or pick up a bottle from Woodstock Wine & Liquors, and flip through a coffee table book while you listen to some Joni Mitchell or AC/DC. In a cozy nook is the bed with luxurious-feeling Brooklinen bedding, flanked by hanging lamps with leather accents, and a vibrant blue piece by artist Blayne Beacham Macauley﻿ overhead. Another plus? A heated floor in the bathroom. Not necessary in the warmer months but an absolute game changer in the very cold winters of upstate New York. You’ll have all the usual bath amenities provided by custom brand Casa Posta, a hairdryer, and even makeup remover wipes. The driftwood towel rack was a welcome change from the standard towel bar and a nice aesthetic touch. There’s no desk so if you absolutely must crack open your MacBook, be prepared to do it on the couch or if the weather is nice, out on your private deck. But really, if you’re here, take the opportunity to unplug and allow yourself a quiet respite from all that “noise”. Honestly, though, add in a kitchen and I would happily rent this place as a studio apartment! Currently, there are 12 units; when Woodstock Way enters into phase two this year, another four buildings with 13 units will be added, bringing the total to 25 gorgeous rooms. The rooms are spread out across several buildings and range in size. There are also a couple of cabins that would make a fantastic option for those traveling with family or friends. While Woodstock Way doesn’t have an onsite restaurant or bar, you’ll hardly notice given the great selection of dining choices all within walking distance. Popular options include Tinker Taco Lab, Shindig (also owned by Ryan Giuliani and where I had a hearty breakfast the next morning), and Yum Yum Noodle Bar. There’s also A&P Bar (which is a bit more of a walk but a solid choice - try their Shepherd’s Pie for the ultimate comfort food), and the popular Sylvia, with a sustainable, sophisticated menu and a fab interior to boot. The hotel offers in-room massages and I highly recommend you book one because it will be the finishing touch on your relaxing stay. My massage was administered by Kathryn Andren, a licensed massage therapist who specializes in lomilomi massage, craniosacral therapy, and energy healing bodywork, and is also an astrologer. Kathryn drove up to the door of my room, set up her massage table (complete with a heating pad), and made sure my phone was turned off before I settled in for 60 peaceful minutes of absolute bliss. Her gentle massage combined the long strokes of lomilomi with energy healing, intuitively finding and tapping into certain energy points that had me asking myself “wait, what did she just do there?” as I felt something happening. She has a wonderfully calming aura and you can tell she’s a beautiful soul…and I’m seriously considering booking a reading with her. Woodstock Way has several massage therapists on their contact list so you might have the pleasure of working with someone else. Chat with the hotel beforehand if you have any questions or specific requests. It’s also good to do this since some of the smaller rooms may not be able to accommodate an in-room massage so keep this in mind before you book. Other music curators include: Danny Clinch (rock photographer), Michael Lang (music promoter and co-founder of the 1969 Woodstock Music & Art Festival), Matt Burr (former drummer for Grace Potter and the Nocturnals), and Simi Stone (a local singer and artist). There’s an outdoor patio with a fire pit down by the water that will be absolutely lovely in nice weather. Don’t miss out on the chance to while away an hour or two here with good company (or by yourself). Disclaimer: The Caviar Spoon ReBelle was hosted by Woodstock Way Hotel but all opinions expressed are our own.